1. Who has shone brighter in the postseason? Henry Abbott, ESPN.com: LeBron James. He has been more productive in the measures that matter from the box score, and the real argument he's the MVP of the postseason so far is that he's right up there with Kevin Garnett as the playoffs' best defenders. Israel Gutierrez, ESPN.com: LeBron has had the more consistently great postseason, and between the two of them, LeBron's Game 6 in Boston has to be considered the best single game. Of course, the final decision will be based on who performs best in this last series. Zach Harper, Daily Dime Live: Kevin Durant. LeBron James has been better, overall. However, Durant has been destroying teams at the end of tight games. He's six for eight in the final two minutes of the fourth quarter or overtime when he has a chance to tie or take the lead. The brightest star with fans is often the one doing the best at the end of playoff games. That's KD right now. Marc Stein, ESPN.com: I give Durant the edge because of the three champions OKC had to mow through (Mavs, Lakers and Spurs) to get here, his consistently clutch play during those mowings and because LeBron has wowed us in the conference finals before. LeBron will be judged on this round. That was always the deal. David Thorpe, Scouts Inc.: It's a dead heat. Each seems to take the lead after their last game. Durant helped carry his team to defeat better teams than the Heat did, but LeBron's wins were slightly more impressive considering Bosh was absent for all but those last two games. 2. Which one do you expect more from in the Finals? Abbott: In terms of total contribution, I see no reason not to expect more of the same, with James slightly more productive. The Heat are the better defensive team to boot, and in James they have a defender with the potential to really frustrate Durant. The Thunder have a ton of other offensive weapons -- it would be surprising if this were the series where Durant's numbers took a big leap. Gutierrez: I expect more from LeBron, because the Heat will probably need more from LeBron. Durant has Russell Westbrook and James Harden, both of whom can give the Heat nightmares with their penetration and pick-and-roll play. LeBron's support right now features a struggling and possibly injured Dwyane Wade and Chris Bosh in just his fourth game back from injury. Harper: LeBron James. 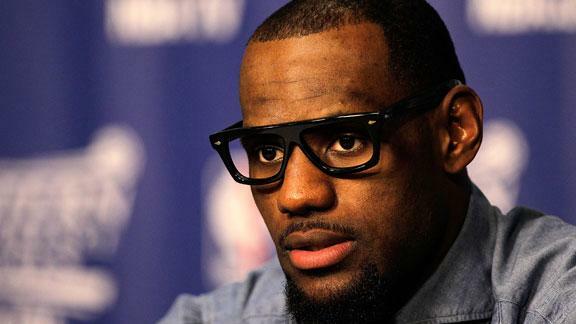 Many people, including myself, consider LeBron James to be the best player in the NBA. This is a matchup that could greatly sway popular opinion in that regard. LeBron has to do it all for Miami to win and that means doing more than Kevin Durant on both ends. If LeBron wants to keep his title, he has to do more and win THE title. Stein: I want to say LeBron. But I can't shake the ... let me call it curiosity as opposed to skepticism. Can't wait to see what he has in store with the world watching now. Let's not forget, though, that Durant has better help, which is no small advantage. Miami can't key in on him the same way. Thorpe: Edge to LeBron, who has found a focus and a calm that we have never seen. Perhaps last year's failure in the Finals has helped him find a new level. 3. Which one would you pick to start a team? Abbott: Durant. I think James is a significantly better player right now. But starting a team means years and years of staying patient while trying to build the right culture. You need the most youth and patience you can find. Among superstars, that means you need Kevin Durant. Gutierrez: Still LeBron. He can join any team in the league right now and that team is practically guaranteed 50 regular season wins and a decent playoff seed. And he has at least five more years of that kind of production. Durant's younger and scores easier, but that doesn't translate to winning immediately, unless he has the right teammates. Harper: Despite the age difference, I'd still take LeBron James. I know it means your window is a few years shorter than if you take Durant, but LeBron is still the best player in the league and I'll take the guy that can dominate on both ends of the floor right now. Title windows in the NBA are often short anyway, so I'm going to try to maximize the short-term here. Stein: I've been saying this for years: Durant. For the simple fact that he possesses the most attractive quality you can find in a top-10 superstar when you're building a team: Durant's willingness to commit to the program long-term, regardless of market size, if he believes in the program. OKC has never had to sweat a single day about Durant possibly fleeing via free agency. Priceless. Thorpe: LeBron. Durant is the better pure scorer. But LeBron is the world's best overall offensive player and its best wing defender. No one has been both since MJ, who also was the best pure scorer. 4. Who will end up with more championship rings? Abbott: That depends a lot on the Thunder's finances, which depend in part on Chesapeake Energy. If the Thunder can keep great players here, it's a cinch to predict they'll rattle off a string of Finals appearances. With their youth, that could end in a lot of rings. James, on the other hand, has another few years of being a Finals threat almost no matter who he plays with. Thunder, by a nose. Gutierrez: Touch call, but probably James, and that's based strictly on the fact he's in a conference that looks easier to get out of for the foreseeable future. Stein: Durant is obviously the easy guess. He's four years younger than LeBron and he and Westbrook are locked in long-term with a window that looks like it'll be open for years if James Harden and Serge Ibaka stick around. If the Heat don't win this series, they could well be starting over next season with a new look. LeBron needs ring No. 1 now to set up his future. Thorpe: I'd give LeBron a tiny edge. 5. Who's more likely to take "Greatest Small Forward Ever" title? Note: Larry Bird has been the consensus choice as the greatest small forward ever for about the last 25 years. Abbott: James. His total contributions put him in the greatest player ever conversation. Don't have any desire to envision an artificially low ceiling for Durant, but, obviously, it is very rare players put together careers like the one James has cooking. Gutierrez: LeBron. Durant, who's still developing, might end up being arguably the best scorer regardless of position. But there's no question LeBron has the overall edge and as long as he wins a title or two, his overall game can't be overlooked. Harper: LeBron James. His all-around game on both ends of the floor is already there and thriving, for the most part. Kevin Durant has greatly improved his passing and defensive efforts while existing as the best scorer in the league, but he still doesn't have the all-around dominance that LeBron shows. So LeBron gets the nod here. Stein: I say neither. But not because Bird is untouchable. Not for these two. The issue is that LeBron and KD came into this league as three men, but they will retire as fours. Neither, remember, is playing next to a Kevin McHale. Henry Abbott is an editor for TrueHoop. Israel Gutierrez and Marc Stein write for ESPN.com. David Thorpe is a writer for Scouts Inc. Zach Harper is an editor for Daily Dime Live.